When I went to the store for the ingredients then my intention was to use red tomatoes, they are traditionally used after all. Then I stumbled upon some Sunbursts sweet golden snacking tomatoes and knew they would be perfect! 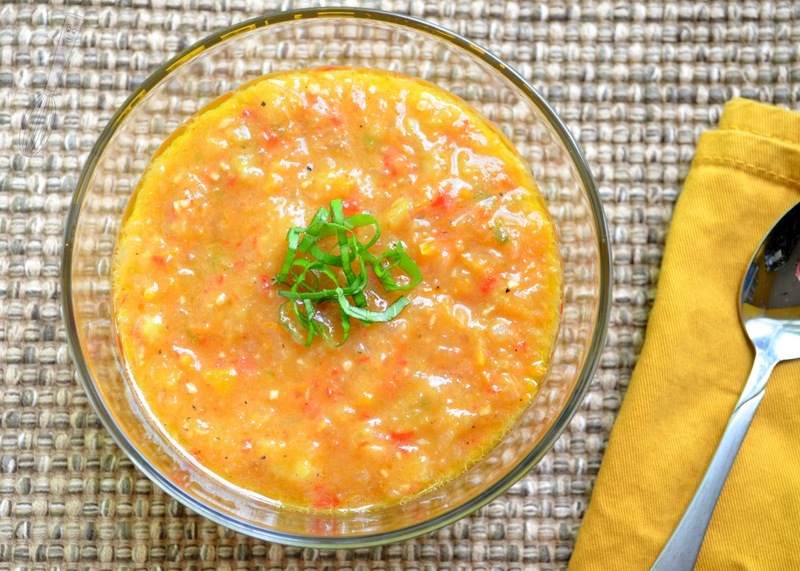 I loved their bright yellow color and the sweet taste that they would add to the gazpacho. I halved them and roasted them in the oven and they had a beautiful golden brown color on the outside. It took a little time but was completely worth it. I may or may not have been snacking on them from the package while I was cutting and seeding the ones for the dish. I chose to use red bell peppers instead of yellow or orange because I wanted the red flecks throughout the soup because I knew I was using yellow tomatoes. A green bell pepper will give you a completely different flavor than a red bell pepper also. I used a red onion instead of a yellow or vidalia because of the flavor profile, it is a milder flavor, and also a pretty color. I can never find pretty red onions in their skins though so I always end up buying the pre-peeled ones in the product section because they I know how they will look on the inside. I wrote in the recipe to roast the jalapeno, this can be done before you start anything if you only have one oven and want to use the broiler for this purpose. I have a toaster oven also that I use for broiling foods sometimes. In this case I used my propane torch (from the hardware store) because I knew I could and will come up with any reason to use it :). I placed in on a cooling rack on a sheet pan then turned it using the stem between "burning" the outside of the skin, so that I could brown it evenly. 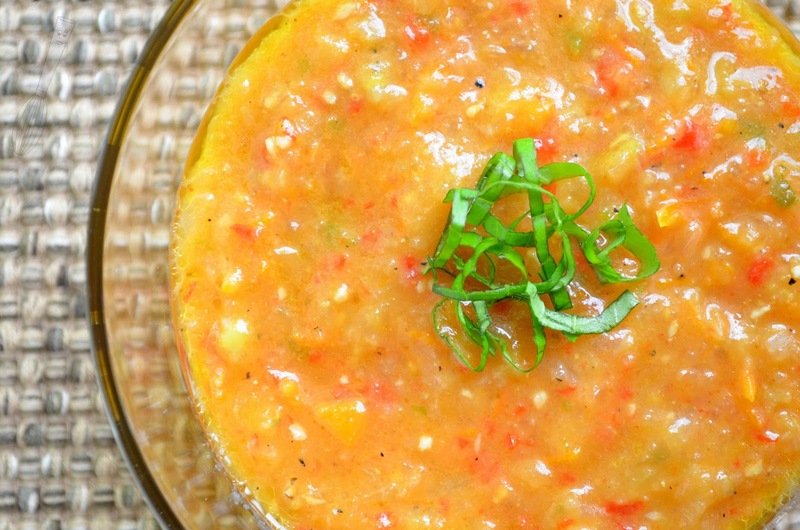 Gazpacho should be made several hours ahead or even a day so that the flavors have time to meld together. I made mine the day before and I was really glad that I did. You may also notice that I didn't add any hot sauce or type of "heat" besides the jalapeno. You could add some more if you want but it has a little heat to it because of the jalapeno, so it depends on your tolerance and how hot you want it to be. I was serving it at a party and didn't know if everyone liked spicy foods so I didn't add anything else. I hope you enjoy this as much as I did! 1. Preheat oven to 425F. 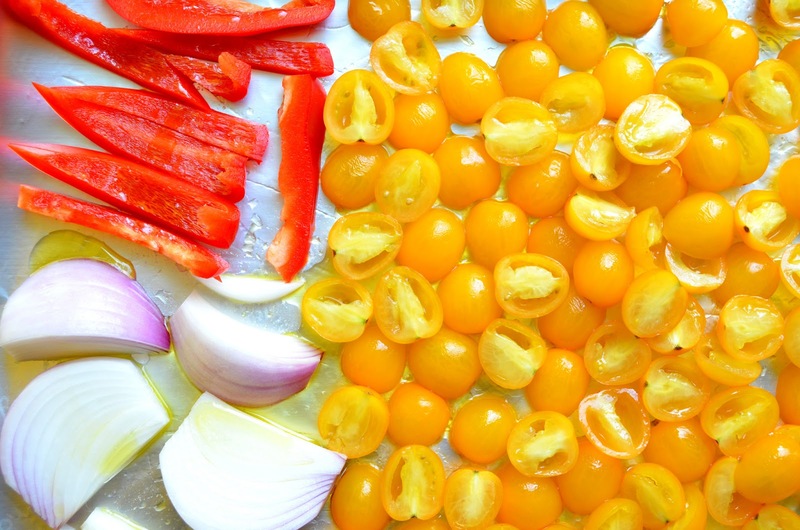 Spread out the tomato halves on ⅔ of a cookie sheet lined with a Silpat or nonstick foil. Spread out the red pepper strips and red onion quarters on the remaining ⅓ of thee cookie sheet. Drizzle all of the vegetables with a little olive oil and sprinkle with sea salt. Bake the vegetables for 18-22 minutes until they start to brown slightly and are soft. 2. Using a broiler, a torch, or a gas stove, brown the skin on the jalapeno until it bubbles, then place the jalapeno into a plastic zip-top bag and seal. Let sit for 5 minutes, then peel the skin off and chop the jalapeno, set aside. If desired, saute the minced garlic in 1 ½ teaspoons olive oil in a small skillet for 1-2 minutes or until fragrant, set aside. 3. 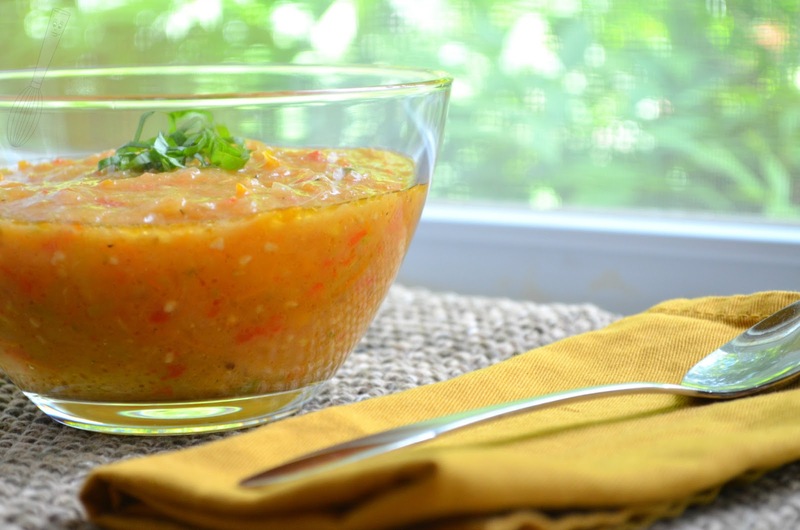 Once the vegetables have cooled slightly, puree the tomatoes in a food processor or blender until the desired consistency is reached then place in a large bowl. Puree the red pepper strips and red onion until desired consistency, then add to the tomatoes in the bowl. 4. Stir in the jalapeno, garlic, cucumber, olive oil, and next seven ingredients (through black pepper) until smooth. 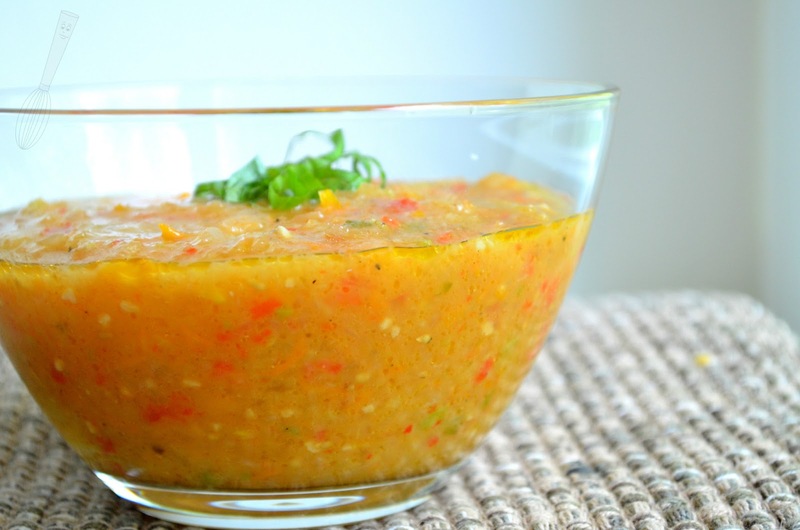 Cover the gazpacho and chill for a minimum of two hours. Pour into serving bowls and sprinkle with basil, serve cold.